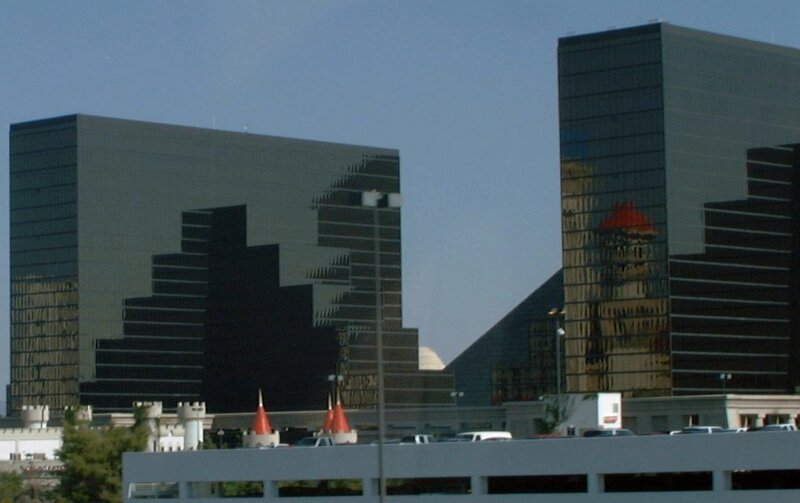 The Luxor Hotel & Casino opened in 1993 with its pyramid shaped hotel of 2,526 rooms. The hotel added twin towers in 1998 bringing its room count to 4,408, making it the nation's second-largest hotel. 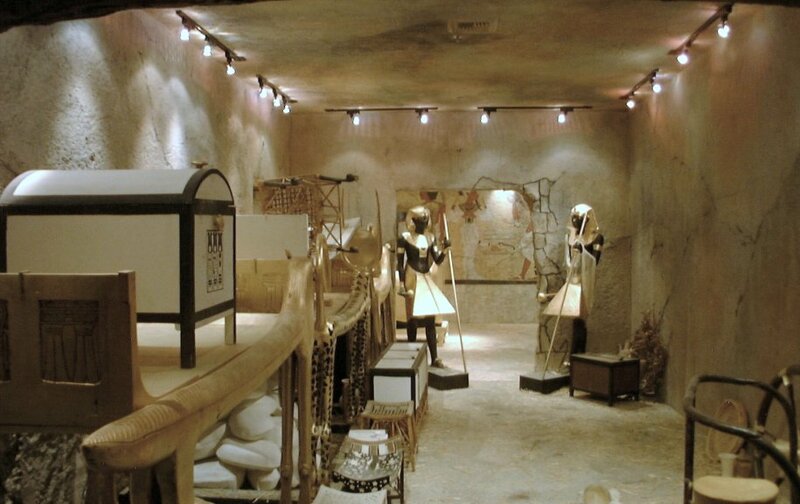 The Luxor houses an authentic reproduction of King Tutankhamun's tomb. The measurements of each of the rooms are exact. The treasures therein were reproduced by artisans using the same gold leaf and linens, precious pigments, tools and original 3,300-year-old methods. Each is meticulously positioned according to the records maintained by the Carter expedition. 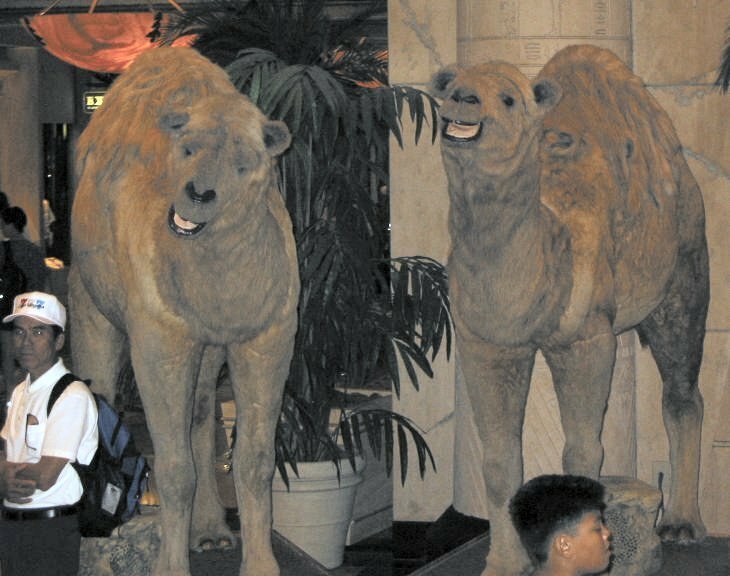 The exhibit houses hundreds of reproductions, including the world-famous guardian statues, King Tut's sarcophagus, and an array of statues, vases, beds, baskets and pottery. NOTE: Being the Egypt-aholic that I am, I have to point out the fact that the real Sphinx and Pyramids are actually located at Giza, not Luxor, in Egypt. 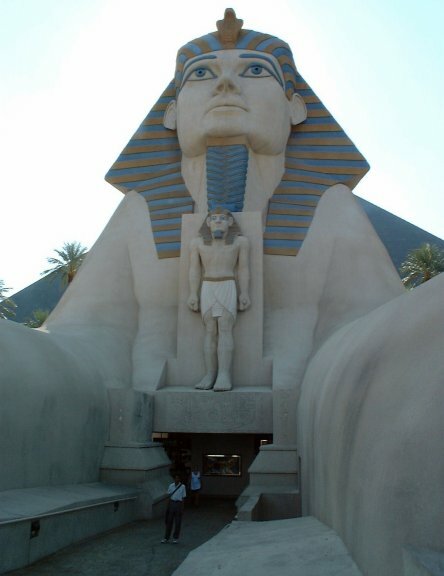 Please click on the thumbnails below to see pictures of the Luxor. 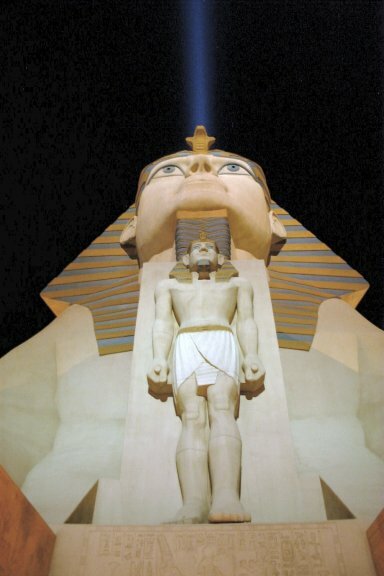 The Luxor’s Sphinx in front of the 350 foot pyramid hotel. 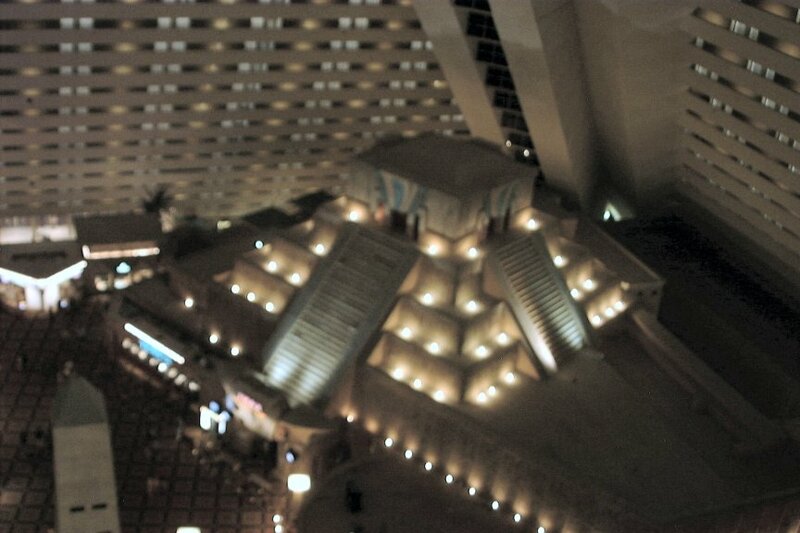 The expansion of the Luxor included this 22-story ziggurat-shaped structure to the north of the main pyramid, adjacent to the Excalibur. In 1997 the pyramid’s edges were illuminated with 3,000 strobe lights and the world's brightest beacon was installed at the tip of the pyramid. 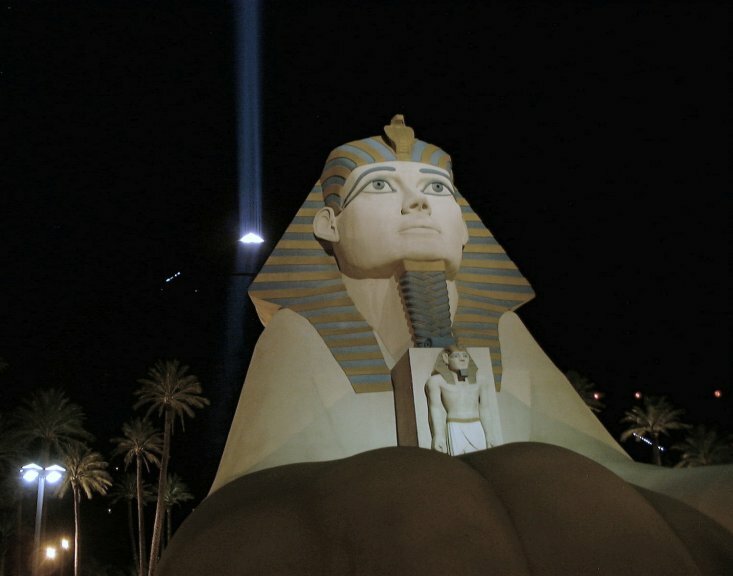 The Sphinx at night. 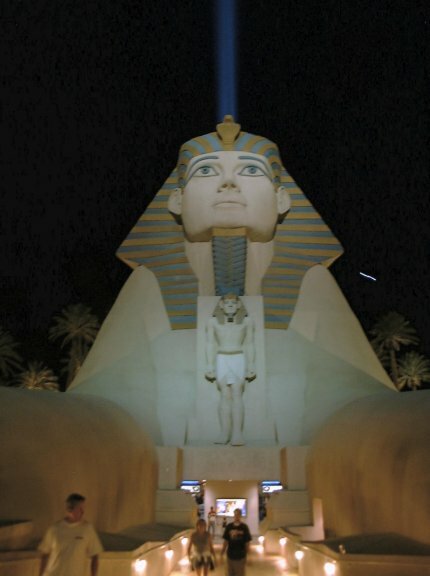 The Sphinx at night with the beacon's light seeming to issue forth from the Sphinx's uraeus headdress. Anubis statue near the main entrance of the Luxor. 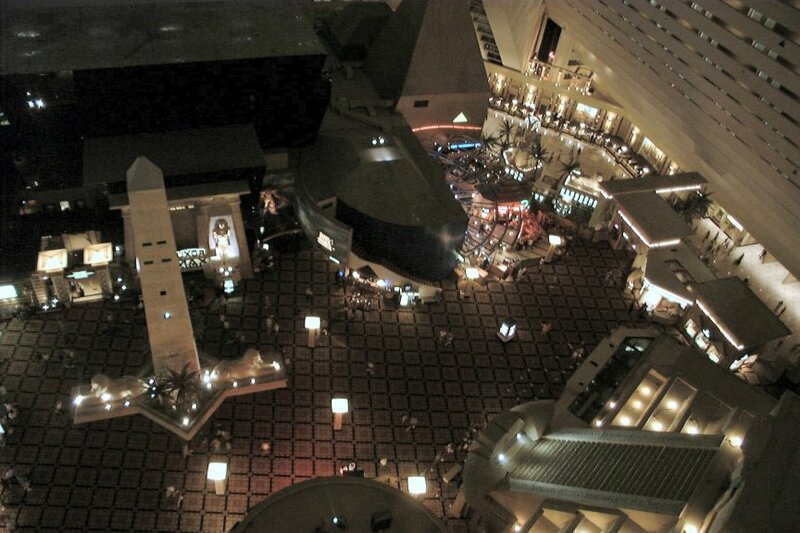 View of the Pharaoh's Pavilion, the World's Largest Atrium, from our balcony on the 21st floor of the pyramid. 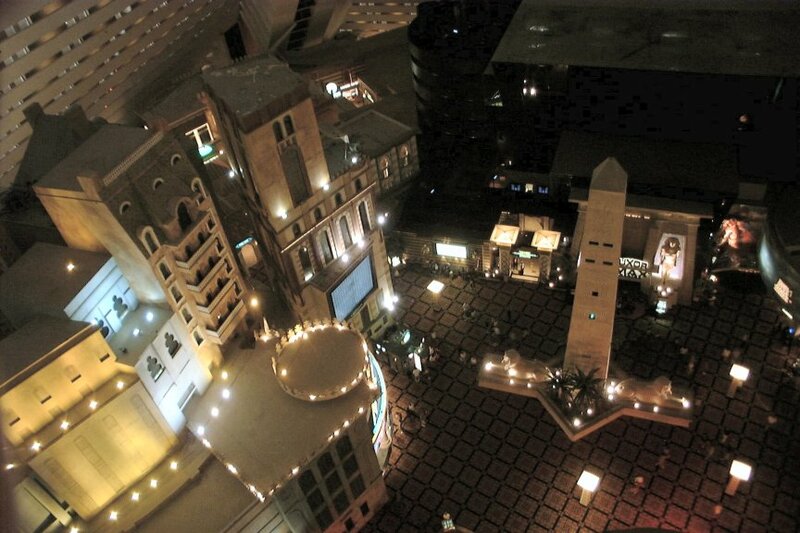 The Pharaoh's Pavilion, located one level above the Casino, boasts shopping, dining, rides and attractions. 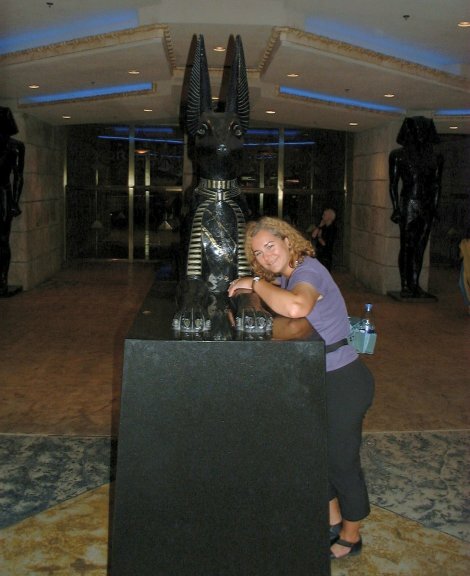 The pyramid within the Luxor. This pyramid is a big "oops" in the authenticity of the Luxor. This is not an Egyptian pyramid (see Giza and Dashur to see Egyptian pyramids). Egyptian pyramids do not have built-in steps nor do they have a platform at the top. This is a Mayan style pyramid. 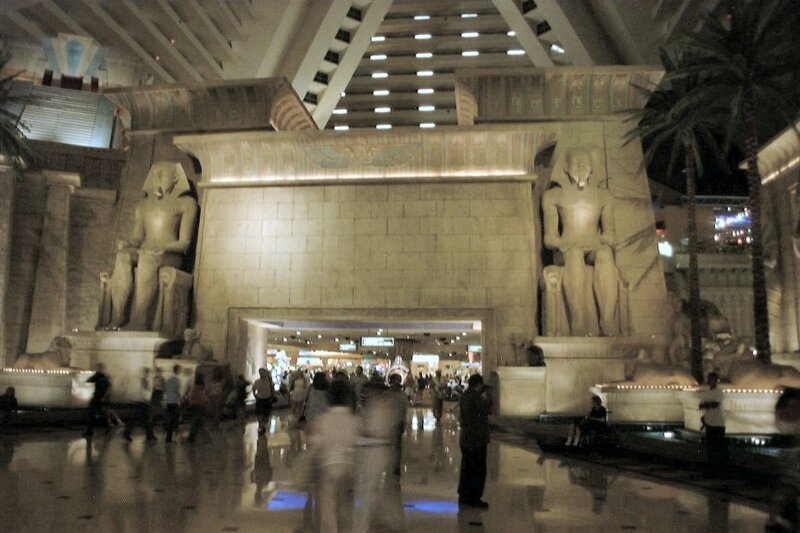 Just inside the lobby, the casino's rendition of the Great Temple of Ramesses II rises 35 feet into the world's largest atrium. Measuring 29 million cubic feet, the atrium is home to the world's strongest beam of light, which shines into the sky from atop the pyramid. Inside, "inclinators" (top of the picture) zip guests up 30 stories at a 39-degree angle to their rooms. 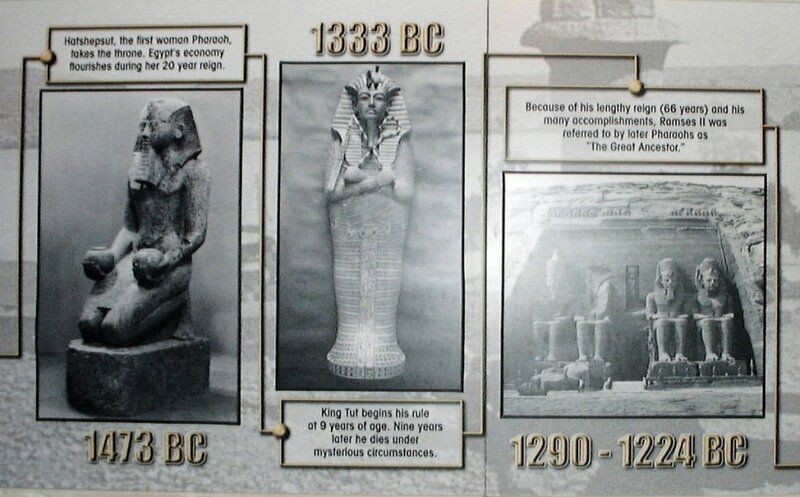 An Abbreviated Egypt Timeline from 3100 to 2134 BCE. 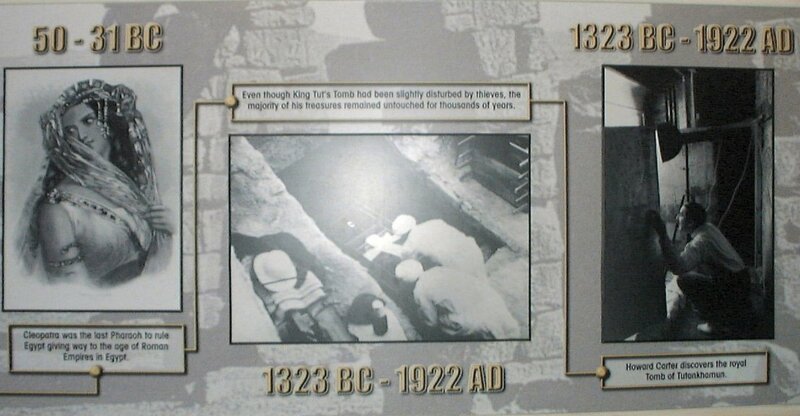 An Abbreviated Egypt Timeline from 1473 to 1224 BCE. 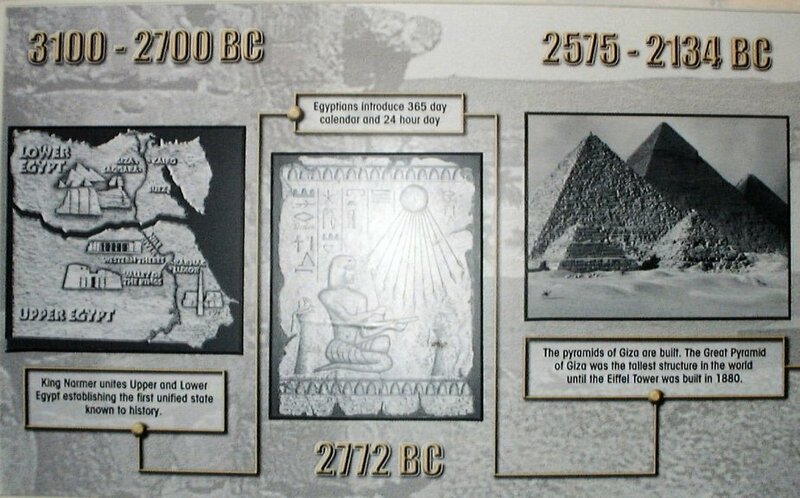 An Abbreviated Egypt Timeline from 50 BCE to 1922 CE. 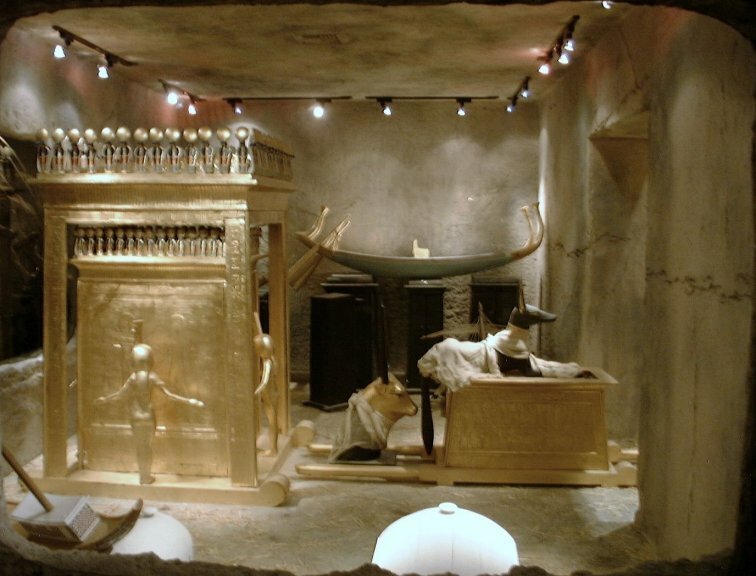 King Tut's Tomb is a museum replica of the tomb as it was found by Howard Carter in 1922. The Canopic Shrine dominated the middle of the Treasury's east wall. 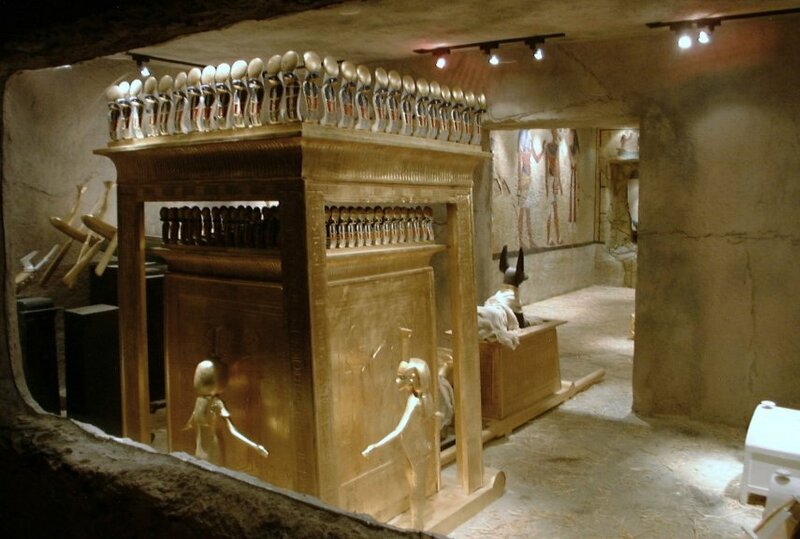 The Burial Chamber was the only room in the tomb with any decoration. The decoration occupies all four walls. The south wall depicts the king, wearing the bag-shaped khat-headdress, being welcomed into the realm of the underworld by Hathor, principle goddess of the west. Behind the king stands the embalmer god, Anubis. Behind him stands Isis and behind her sit three minor deities of the underworld. The opening in the south wall leads into the Antechamber. 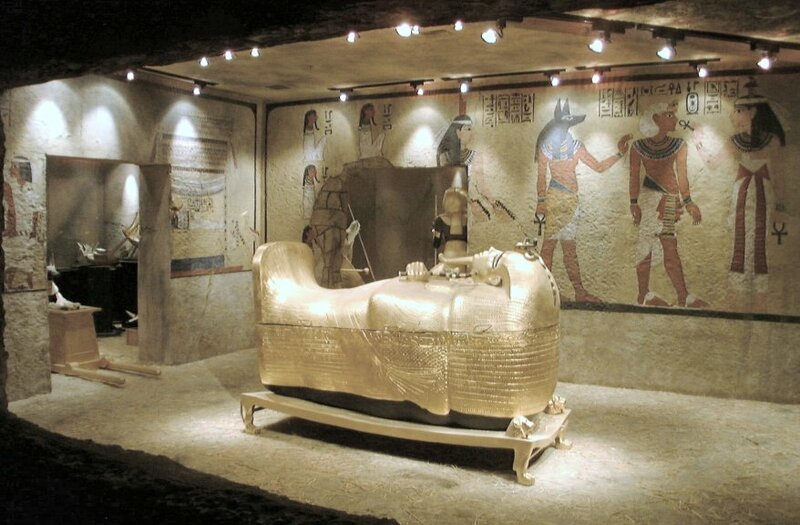 The east wall of the Burial Chamber depicts the mummified king, lying supine within a tall, garland-bedecked shrine, being dragged by five groups of men dressed in white and wearing white mourning bands upon their brows. The opening in the east wall leads into the Treasury. The entrance to The Treasury was dominated by a majestic image of the jackal god Anubis, lord of the west. mounted upon a shrine equipped with carrying poles. 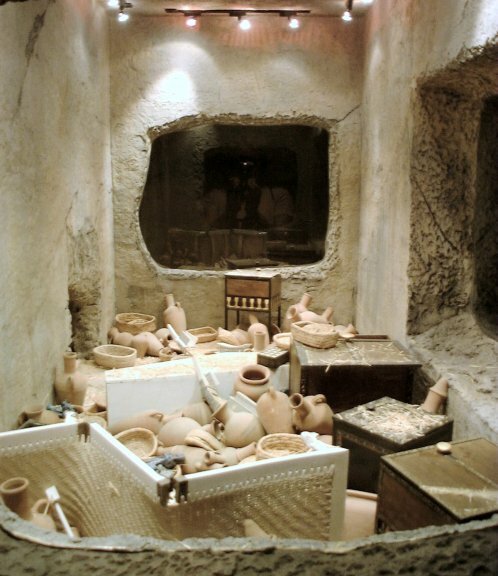 The Annex contained pottery wine-jars, alabaster vessels containing oils and unguents, baskets of fruit and assorted furniture - boxes, stools, chairs, bedsteads, etc. The Antechamber. A pair of guardian statues guard the entrance into the burial chamber. The two statues are life-sized figures of the king in black, gold kilted, gold sandaled, armed with mace and staff, with the protective sacred cobra upon their foreheads.